Thursday before Advent, Thursday after Trinity Sunday, and Corpus Christi day. 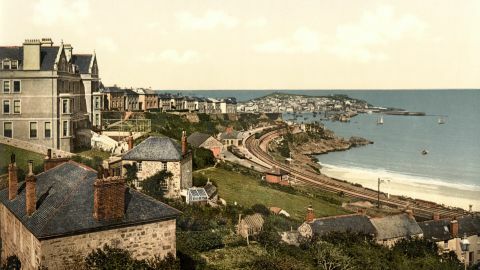 This flourishing port is at the farther end of Cornwall, on the west side of Mount’s Bay, at the terminus of the West Cornwall Railway. It is a municipal, but not a parliamentary borough, with a population of 9,414. Tin, copper, china, clay, granite, and pilchards, are the principal articles of trade here. The peninsula to the west of Penzance is particularly rich in both natural and artificial curiosities. It differs somewhat in its geological character from that part of the county we have hitherto traversed, and is much the richest in its mineral productions. We will now follow the shore of Mount’s Bay past the Wherry Mine and Tol-Carne (a pile of granite rocks) to Newlyn and Mansehole which has some quaint old buildings. The next object of beauty is the Lamorna Cove, from which we can visit Boscawen Carn, a singular pile of rocks. We may here leave the shore, and visit the very old church of St. Buryan with its singular cross, near which are the remains of some ancient ecclesiastical buildings. One mile to the north is a Druidical circle of 19 stones, and a central one called Boseawen Un. Returning to the coast we pass another circle called the “Merry Maidens” and two upright stones. “The Pipers;” at Boskenna, a cromlech. This leads us to Penberth Cove: thence we descend a steep hill, Trereen Castle, a fortified rocky promontory. Here amidst the bold and romantic is the celebrated Logan Stone, weighing 90 tons, though moved with a touch. One day in 1824 it was overturned by Lieut. Goldsmith and his crew, in consequence of a bet; but the people round were so highly indignant that he was compelled to replace it, which he did in a very ingenious manner, having, at the instance of Davies Gilbert, Esq., the President of the Royal Society, obtained help from the Plymouth Dockyard. The Land’s End, the ancient Antivestaeum, the most westerly parish in England – being, in fact, nearly in a line with Dublin and the Western Islands of Scotland. On one side of the village sign-post is inscribed, “The first Inn in England” (if you come from the west), and the other, “The last Inn in England.” Sweetbriar grows here wild. Sennen Cove is a little creek in Whitsand Bay. Longships Reefs, half a mile long, has a lighthouse on it, 83 feet high. 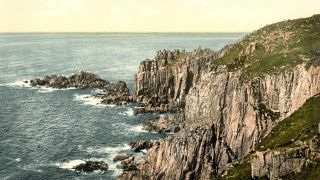 The effects of the Atlantic and the weather upon the hardest rocks (as granite is supposed to be) are visible all along this broken and disintegrated coast – a wild desolate region to the eye, but extremely healthful and inspiriting. Rare shells, sea weeds, and plants, should be looked for. Some miles out are the Seven Stones light vessels. About 25 miles south-west are the Scilly Islands, a group of 50 or 60 granite islands and reefs, with an industrious population of 2,594. They belong to the Godolphin family. St. Mary’s is the largest. Here Sir Cloudesley Shovel, and four ships with 2,000 men were wrecked in a dreadful storm in 1707. A lighthouse has been fixed on St. Agnes since this fearful event. St. Just, where there are the remains of a cross, an amphitheatre, with stone seats, and a logan stone. Close by is Cape Cornwall, with a splendid sea view. Here are the Levant and Botallic mines, both prosperous concerns, and finding tin and copper. Botallick Mine is worked in the very face of the cliffs, and runs out 100 fathoms under the sea. It was descended by the Due de Nemours, Prince de Joinville, and their party, in 1852 and by the Prince and Princess of Wales in August, 1865. The Mayne or Maen stone is pointed out as that on which the Saxon King, Ethelbert, and six other kings, dined, in the year 600. Several stone circles intersecting each other may be seen here. Our route now lies by the Lanyon Guoit, a fine cromlech, to Pendeen, near which is Chun Castle, an oval inclosure, with vallum and ditches, and a Cromlech near it. Here we may visit the gravestone of Riolobran, and the holed stone, from which we round Gurnard’s Head (at Zennor another cromlech), whence we may return to Penzance by Madron (with the remains of a holy well), and Trengwainton Cairn, being a tour of a few days, unequalled in England. Before leaving Penzance, however, we would recommend a visit to Gulval Church and Cross, and a fine Cairn, Castlean-Dinas, an old fortification of three circles, and Ludgvan Church, where Borlase, the historian, lived and died – a short morning excursion. This town was formerly an important mail racket station. 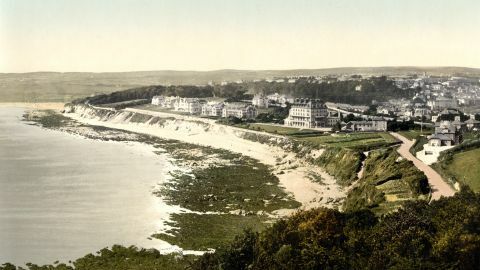 Below it are Pendennis Castle and St. Anthony’s Light, on the opposite sides of the entrance. 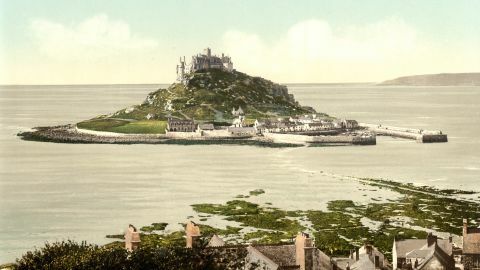 A little more than a mile to our left is Marazion, or Market Jew, of some importance in the middle ages as the place of resort for pilgrims proceeding to St. Michael’s Mount.